Q. Can you say what happened in 1947 in Roswell, New Mexico? Did a UFO crash and, if so, what happened to the people in it? A. Yes, that was one of several instances in which the occupants of a UFO (from Mars), deliberately crashed so that the American authorities could examine the crashed vehicle and the bodies. They had to do this quickly since the vehicle and the bodies would disappear very rapidly. There were five occupants, four were killed immediately and one survived for a time. All were medically examined by the authorities. After some time the bodies disappeared, melted into a jelly-like substance, because they have bodies of etheric matter. Their bodies and vehicles can manifest at higher etheric levels or they can be made visible to us by lowering the vibrational rate. The US authorities learned a lot; they gathered a lot of information from the vehicle before it, too, disappeared or disintegrated. Q. How far are we from being able to use the technology of light? A. As soon as we give up war for ever, and destroy all weaponry, we will be given by the Space Brothers the Technology of Light. It depends on ourselves. As soon as we abandon war for ever. If we were given that technology but we had not yet abandoned war it would be a thousand times more dangerous than nuclear weapons. So, we would never be given that knowledge if we hadn’t genuinely given up war and conflict permanently. Q. Some people plan to colonize Mars and Venus. What would the Martians and Venusians say about this? Q. There’s enough food in the world for all, but what about water? A. Well the same principle applies as with food. We need to learn to share. There are countries where water is scarce – e.g. Israel and Palestine use the same water. Israel uses most of the water and the Palestinians must make do with the rest. It is essential that we share. Q. On other planets where people are more advanced, have they ever brought themselves to the brink – as we are doing? Were they rescued? And are we just doomed? A. We are not doomed. We are now in the Age of Aquarius. The trouble is that still half the population of the world is Piscean – they like the energies and ways of Pisces. They are suffering; they see the old ways disappearing. Piscean people are the exponents of the outworn, old, competitive structures. They come from the past and they have nothing to give the world now. Their message is of the past. The conservative governments of the world are conservative forces who deny the energies of Aquarius, the energies of the future. They offer a future of unity. The energies work through groups only – not through individuals, but groups. Gradually people will develop group consciousness. The Masters have no separate sense of themselves – they have group consciousness. They see and think of themselves as a group. They are the group who manifest and anchor in the world the second aspect of divinity – which we call Love. Q. Did the recent overshadowing (See Questions and Answers, Share International September) take place throughout the world? A. No, they were limited to the UK. Q. How can someone experience their own divinity? A. Everybody is a God, who has the potential to create all things. When you see Maitreya you will find Him extraordinary and very simple, simpler than you can imagine. You will find Him so humble you cannot imagine the humility of that man. He doesn’t want followers. He is a teacher. He wants to teach and we, if we want, can learn. Maitreya never infringes free will. But He teaches with grace, with understanding, simply, so that we can make sense of very complicated questions, the meaning and purpose of life. Do we know the meaning and purpose of life? Do we know why we are here? What is the purpose of being on the earth? We think we can do anything but we know nothing. We will have to become like children again and work with the Masters and where we need to be taught They will give Their advice. Maitreya doesn’t want you to worship Him as a God. People worship their idea of Christ, their idea of the Buddha, their idea of whoever they seek, Krishna or whatever. He wants you to be you; to be who you are, not somebody else. Not imitating somebody, but to be yourself. God is an experience to be expressed. You expand your consciousness to become aware. It is all to do with awareness. We do stupid things because we are not aware. We forget. We don’t understand the Laws governing our lives; we just treat them as nonexistent, but there are Laws. Life is an art. It has to be learned and the Laws governing it have to be learned and be respected. The art of living will develop unbelievably at this new age — in every aspect of our lives. It will be worth being alive at this time. Maitreya in the ‘guise’ of a musician at the Cathedral of Notre Dame in Die, France, on 6 August 2016. On the morning of 6 August 2016 my husband and I were taking our daily walk from the local campground to Die centre, Southern France, when we heard the church bells of the Cathedral of Notre Dame of Die. As we walked we talked about being honest in life, truly committed to your path in life, even if this doesn’t fit into other people’s ideas and expectations. Topics like reincarnation, the presence of Maitreya in our world and the existence of extraterrestrial life are often challenging to bring up in talks with other people and quite often we felt mocked. We discussed Maitreya’s teachings and the necessity of truly being yourself and not masking oneself in adaptive behaviour. Earlier that week I prayed for help in keeping up our connection in the frame of Light Work of the Spiritual Hierarchy in our chaotic and shaky contemporary world. I felt a strong urge to visit the cathedral and light a candle. As we entered I was surprised to hear very beautiful, moving music filling the cathedral. As I lit my candle I found myself lifted up, as if I was merged into the sound which was penetrating my heart. As I stood absorbing the energy of the music I was surprised to see the source of the music: a man sitting alone in the lotus pose on the stone floor in front of the first row of chairs. He had a kind of Indian organ in front of him, which he was playing in total devotion. He sang and played with all his heart in a very natural way, as if all his presence was immersed in his playing. The intensity of his performance made it special and unfamiliar. It was absolutely beautiful, but a bit unearthly in its unique quality. He had no audience, and wasn’t collecting money, like the musicians in the street outside. He was fully aligned with his singing. I thought of my personal situation and how easily I get distracted by daily concerns about food, taking care of the children, paying bills, other duties and world news. How different this musician was in his total attention and absolute concentration. There were no words, no mantrams, he sang from his heart accompanying himself on the Indian organ; it felt as if he was singing and playing for the whole of Cosmos, as if his presence was immersed in a work of absolute service. The energy of the music was like the energy in the overshadowing by Maitreya during Transmission Meditation. I wondered if this could be Maitreya. Then a group of churchgoers entered the cathedral. They heard the musician singing and discussed the unexpected situation. A short while later the sacristan joined them; I sat hoping that he would permit the musician to continue his beautiful playing and that he would appreciate the special music. I was thinking that this world needs more love and tolerance and we could embrace a symbolic deed of tolerance here in Die! I smiled about myself: if this man is Maitreya then he can take care of the situation perfectly himself! The sacristan observed the musician for a few seconds and permitted him to continue. My husband, Jan, thought that if this beautiful work is your path in life then no less than deep respect needs to be offered. It made him feel that we all have to travel our own path in life. Jan took a photo of the musician and gave him some money. “Vous êtes très genereux,” he remarked with a big smile to Jan. For a slight moment he stopped playing. We had to leave to meet our teenage daughter. While the musician was playing we walked in front of him, not wanting to disrupt his playing but also wanting to express our thanks for his blessed music. The musician had an Indian face and dark eyes: his eyes were full of love and gentleness. We felt as if we met Maitreya. I recognized the eyes and energy from other photos and Transmission Meditation. We nodded, in a way I felt speechless and filled with intense love and blissful joy. Together we silently walked out of the cathedral into the sunlit busy market place, both wondering if we had been blessed by the music and energy of Maitreya. M.L. and J.K., Volendam, the Netherlands. (1) On 15 May 2016, at Mediatheque in Sendai, Japan, we hosted a lecture event by Michiko Ishikawa for the first time since the earthquake and tsunami disaster six years ago. The hall’s capacity was 180 seats, and it was full before the lecture began. The extra room we prepared for a simultaneous video projection feed on a large screen was quickly filled but a problem developed and there was no sound. The staff members checked the audio devices and explained the situation to the audience. While I was running around, trying to cope with the unexpected situation, I was called by name by one of the visitors. He said, “I know you well, Mr Matsumoto. Everything’s going to be all right.” He was middle-aged, with short hair with a bit of white and a fine-looking face. I was surprised to hear my name called by a stranger. I asked myself if I had met him before. I felt as if I had. The audience in the extra room moved to a space in front of the television monitor in the corridor because they could not hear the sound. They were watching the lecture on the monitor, some standing and others sitting on the floor. The hall’s manager warned us not to allow people to stand or sit in the corridor for safety reasons, but the sound system could not be fixed in the other room and we were panicking. Then the man appeared again and said cheerfully, “There are several vacant seats in the main hall and some space for standing. I am an architect and I know well.” I was about to stop him, saying, “standing is not permitted”, but he ran away with such a speed that I could not catch up with him. After a while the sound was restored, and for the question-and-answer session, people in the extra room could move to the main hall. We were relieved. After the program was over, I walked past the man again who was mingling with other visitors. I thanked him for the help earlier. Although he returned a smile with his eyes, he seemed to be observing the visitors around him. He was friendly and lively, fresh and self-confident, like a master carpenter or a manager of a festival event. He was a wonderful visitor who worked as hard as a member of staff. He left a lasting impression on me. Was he a special person? (2) We had a trouble in the extra room and staff members were busy handling the situation. I found a visitor repeatedly going in or out of the extra room. He was acting as if he were a staff member. Later I heard that he was the man who took the visitors in the extra room to the space in front of the television monitor in the corridor. He acted more appropriately than staff members and he did not seem to be an ordinary person. He was of average height and weight. Was he simply one of the visitors or did we have a helping hand in handling the trouble? I greeted that day feeling refreshed since I had had many telephone inquiries until just before the lecture and I thought that we had done everything we could to advertise the lecture event. We had about 220 visitors for the 180-capacity hall. During the break after the lecture, I was walking fast in order to bring the question cards from the audience to Ms Ishikawa when suddenly I was spoken to by a man. He had short white hair and was of average height and weight in his forties or fifties, wearing a beige vest with many pockets. He had a fine-looking face with pure, bright and vivid eyes. He was in a very positive mood and as if he were waiting for me, he greeted me with a smile, raising one hand and saying, “Yo! I have come”. It was so unexpected that I cannot remember how I responded. I was so surprised to hear such familiar greetings by the man as if he had known me for a long time and been a close friend or an old acquaintance. I might have seen him, but I could not remember him. Later when I talked with my husband and realized that the man who spoke to him and the man who greeted me was the same man. In spite of the sound trouble in the extra room, everyone except two people remained and listened to the story intently. It was really a wonderful day. Did we have a special visitor, helping us to cope with the difficult situation? On 18 December 2015 during Christmas shopping for presents, I met my son at a large electronics store in Trencin, Slovakia. We looked at different laptop computers, when a man came in the store. Immediately he caught my attention. He was in a jolly good mood, greeting people in a friendly familiar fashion, while making his way through the store. He seemed like Santa Claus with his cheery mood. His full beard seemed to go in every direction. There was a sparkle in his eye. His dress was rather peculiar. He was dressed like a homeless person. He wore a long turquoise coat and on his head he wore a grey woolen cap in the shape of a Christmas tree with a woolen ball at the top. I pointed him out to my son, who was busy comparing computers. He made me smile with his cheery mode. After a while a security guard guided him out of the store. I wonder if this man was Maitreya? The traffic at 6.45pm, on this chilly dark evening, 30 December 2014, was nearing the end of rush hour and was moving at a moderate pace, which seemed appropriate for the partly icy county roads, which were dry enough if you stuck to the well-beaten traffic tracks; but outside the tracks, icy conditions prevailed. Two of us from the Boulder Transmission Meditation group were on our weekly trek to attend Transmission Meditation in nearby Longmont, Colorado, at Connie Schaefer’s house. We were in the passing lane, when a car suddenly swerved towards us from the right lane and very nearly hit me in the passenger seat. My automatic-response-mechanism kicked in and I shouted “Oh, my God.” Co-worker Zach Castleman veered the car to the left edge of the road to avoid being hit. Due to icy conditions, the car was impossible to control and began to fishtail, swerving back and forth several times, then turned 180 degrees, traveling backwards with oncoming traffic coming right at us. The car continued to move backwards, but then moved from the left side of north-bound traffic lanes to the far right side of the road. Our reverse momentum was now slowing. Our backward movement was along the side of a rather deep ditch. Then I felt the rear end of the car heading for the ditch, which seemed endlessly deep in the dark of the evening, and I felt we could overturn; however, the car then seemed to slowly ease into the ditch, rear end first, and we came to an amazingly gentle, if somewhat abrupt, stop. Traffic continued, but the front of the car was out of the stream of traffic. Even though we were at a very steep angle, we were safe. We looked at each other with relief. I phoned for help and was told there would be a three-hour wait due to high demand. Within a fairly short time, two young Hispanic men in a pickup truck stopped and offered to pull us out. I was really surprised how effortlessly they were able to pull us out. We thanked them profusely and they hesitatingly accepted some money for their trouble. Meanwhile, the driver who almost hit us found his way to our car and apologized. He said we had been in his “blind-spot” and he hadn’t seen us in his rear-view mirror. We proceeded on our way and arrived only 30 minutes late, a bit shaken but no worse off for the experience, feeling very happy to be in one piece. Did someone special help move the car to safety? Were the two Hispanic young men anyone special? We present a selection of quotations on the theme of ‘The Path to God’. The quotations are taken from Maitreya (Messages from Maitreya the Christ), Benjamin Creme’s Master (A Master Speaks and Share International), and Benjamin Creme’s writings. We know the outcome of man’s present dilemma, and aid to the full extent of karmic law. We know, too, that man, of his own free will, must choose the path to future glory: the path of brotherhood and love, justice and sharing. The Path of Return is the Path by which the consciousness of what is and what might be gradually becomes known to the seeker, the evolving individual. People will begin to understand that humanity is travelling together as one huge group, at different stages of the evolutionary journey. We are all travelling together on a path to something tremendous which our minds at present find difficult to truly understand. It is easy for a Master to say: “You become God-like beings who demonstrate all the qualities of God.” We do not even know all the qualities of God. We think we know the intelligence of God. We have an inkling of what a mighty intelligence might be like, or a capacity to love totally and unconditionally and we imagine God’s love must be like that. Something as mysterious as the Will of God will begin to attract the minds of many people. They will want to understand that extraordinary mystery – how the Will, the Purpose of God, can be known, what it is, how it demonstrates. What further aspects of God must we recognize in order to fully understand the aspects which we think we already know? Despite all evidence to the contrary, men are ready – indeed, longing – for change, for a restatement of the reality of Brotherhood and Justice, for the necessity of Harmony and Peace. Thus will men respond to the call of Maitreya for these ancient symbols, now translated into practice. Very soon now, the world will know that the long wait is over, that the Son of Man has kept His promise, and that a new era has begun. When men see Him they will understand the reasons for His appearance and the need for their co-operation, for He will outline the major needs of the time and invite their help in reconstructing the planet. Much there is to do, for a whole world awaits its transformation. Many hands are needed, for the changes involve all men. When Maitreya enters, openly, the stage of modern life, He will beckon to His side an army of willing helpers. Through them He will administer and oversee the planet’s restoration. Time, now, is short indeed before Maitreya’s face will be seen, His presence known, His counsel listened to with care. His advice will cover the gamut of present ills and point the way to their amelioration and cure. His voice will speak for those who suffer most: the halt, the lame, the outcast and the poor – for all who suffer silently and needlessly. He will galvanize those who long to help their brothers and set in motion the new crusade of service. Thus will it be. Thus will Maitreya inspire the formation of groups of planetary pioneers, whose task it will be to bring succour to the long-suffering needy of the world. A sustained programme of aid, far outdistancing anything so far seen, will quickly restore the lives of those in greatest need. Thus will emerge a new atmosphere in which the most ambitious changes can take place in a spirit of goodwill. The General Good will replace self interest as a measure of men’s actions, and in growing harmony the peoples of the Earth will move forward into the new age. Thus will it be, and thus, under the guidance of Maitreya and His Group, will men find themselves once more on the right path – the path to divinity. Samnanger, Norway – On 11 January 2016, at 9.45am, T.W. photographed a “star-like object shining brightly in the south-east” sky. A huge, intricate crop circle has drawn crowds of people to a farmer’s field near Mammendorf, about 33 miles west of Munich, after it was discovered on 21 July 2016. These two UK crop formations are confirmed by Benjamin Creme’s Master to have been made by spaceships from Mars. K.E. took this photograph of light patterns in Ikebukuro, Tokyo, Japan, on 31 August 2016. Light patterns photographed by N.d.G. in Marnixstreet, Amsterdam, the Netherlands, on 24 August 2016. Light patterns seen in Madison, Wisconsin, USA, on New Year’s Eve 2015, photographed by E.T. According to researchers, dark energy and dark matter constitute a whopping 95 per cent of what the Universe is made of. Dark energy is dark, meaning it does not make up the visible stars and planets. It’s also too weak to be measured, but its accumulation over billions of light years renders its effects visible. While it had been known since the 1920s that the universe is continuously expanding, Clark explains that the effects of dark energy first came to light in 1998, when two independent studies showed that the expansion of the universe was accelerating, indicating the presence of an undefined force pushing galaxies apart. Scientists had expected to observe expansion from the enormous energy created by the original Big Bang, but they had theorized that the braking effects of gravity would be slowing it down. Their observations that the expansion of the Universe was accelerating came as a shock. Those familiar with the Ageless Wisdom Teaching might suggest that science appears to be nearing a long-awaited revelation – one that recognizes that dark energy is really, in fact, what occultists call the etheric planes of matter. In his book, The Reappearance of the Christ and the Masters of Wisdom, Benjamin Creme refers to the etheric planes as an “ocean of energy”, describing them as four planes of still finer matter, “above the dense physical-solid, liquid, and gaseous which constitute the etheric envelope of this planet, and of which the dense physical planes are a precipitation”. 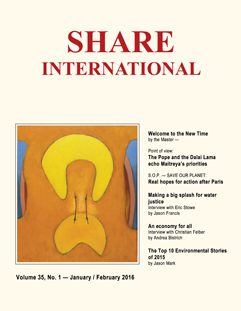 He further comments in Share International magazine that, “All matter is a precipitation of light and so the field of matter is light precipitated into seven more or less material planes.” Alice A. Bailey’s A Treatise on Cosmic Fire confirms that while the etheric planes are “gradations of physical plane matter of a rarer and more refined kind, [they] are physical nevertheless”. Wilhelm Reich (1897-1957), the well-known psychoanalyst and scientist, also discovered this primordial energy – which he called ‘orgone’ – and considered it to be an energy interpenetrating all forms of matter. Reich experimented with orgone in many ways, developing simple technologies and tools for healing and even cloud-busting and rain-making. So revolutionary were his studies that the US Food and Drug Administration (USFDA) had him arrested on charges of fraud and sent to prison where, sadly, he died. It was also ordered that his books be burned. Scientific discovery of the etheric planes clearly has enormous implications for humanity, potentially revolutionizing all aspects of life on our planet. Scientific investigations of these subtle levels of matter would explain how homeopathy and other alternative healing methods such as acupuncture actually work, and what happens to human beings after the death of the physical body. Perhaps, most importantly, it would open the door to public recognition of the value of meditation, the multi-dimensional constitution of man, and the ancient truth of the evolutionary journey of consciousness. Until then, scientists continue their attempts to decode the elusive nature of dark energy, noting that better data, and more of it, is needed. The most recent efforts have culminated in the largest map of the universe to date, taken using a 2.5metre-diameter telescope at Apache Point Observatory, New Mexico, and released in July 2016 by the Sloan Digital Sky Survey. This remarkable photograph took five years to produce and reveals dark energy’s effects, as its interplay with gravity results in the distribution of galaxies across the Universe. The map charts the positions and distances of 1.2 million galaxies across a volume of nearly 650 billion cubic light years. A single dot represents a galaxy – home to a few hundred billion stars. Researchers are using the map to search for spherical ripples or baryon acoustic oscillations (BAO) created by sound waves in the early Universe, which expand through the interplay of gravity and dark energy. The combined work of hundreds of astronomers working independently around the world has shown that dark energy appears to be a “cosmological constant,” which Clarks says, “suggests it is a constant energy field stretching throughout space”. The next attempt to study dark energy launches in 2020, as the European Space Agency inaugurates its six-year-long Euclid mission, with more than 1000 scientists representing 14 European countries participating. Euclid will attempt to map the shapes, positions and movements of two billion galaxies across more than a third of the sky. As the website for Hetdex, the Hobby-Eberly Telescope Dark Energy Experiment, eloquently expresses, such ongoing efforts will, “help us understand the vast cosmic ‘ocean’ of dark energy – an ocean that we are just beginning to explore”. During the 2016 NAACP (National Association for the Advancement of Colored People) Convention in Cincinnati, Ohio, USA, our Share International booth was directly next to the booth of three inspiring young fellows. With the help and encouragement of their parents, they started a service project this year called Sole Bros Inc, providing new or “gently used” sneakers to young people who don’t have access to such items. The 13-year-old boys are elite athletes and student scholars who attend exclusive private schools in Cincinnati. I wanted to learn more about their story, so I asked them if they were open to an interview for possible inclusion in our magazine. They liked our simple message of the unity in diversity of humanity, and said they would be happy to be interviewed. The boys told me that the idea for the project had come up one day as they were proclaiming their desire for the latest high-priced sneakers. The mother of one of the boys said it was disturbing that so many young people around the world did not even have shoes while people in wealthy countries had so many. She had been to Jamaica and had seen children with cardboard tied to their feet. The boys thought this was sad, and spontaneously said they wanted to ship their outgrown shoes there. So the discussion on how to do this began and grew. In just a few months, they were hosting regular events called ‘Feet Fetes’ at area stores where people could donate used shoes or money for new shoes. They said that the idea seemed like a joke, but people were so willing to help, and it was so enjoyable, that they just kept going step by step. At the NAACP Convention the boys said they had just returned from Jamaica where they had partnered with local nonprofits to distribute more than 1,000 pairs of shoes. Their trip included volunteering at an annual summer camp run by the RuJohn Foundation, whose focus is sports and empowerment for children up to age 20. I asked the boys what they thought of the trip and the people they met. One said, “The children there were so joyful, just smiling ear to ear … you don’t see that here. They appreciate what they have, and they are gonna be happy no matter what. Here in the US, in my school for example, we are so depressed.” Another boy mentioned that during the self-esteem sessions at camp, the young people were asked what they wanted to do in the future. He was impressed that so many of the young Jamaicans said they wanted to help their parents so they didn’t have to struggle so much. As for the future of Sole Bros, the boys said they have support and offers to bring donated shoes to Ghana next year, and possibly Haiti after that. They have also been invited back to camp with RuJohn. They said that meeting these young people in Jamaica, and everyone who has been willing to help them along the way, has made them fully realize that you’re never too young to help change the world. And they hoped that their work would in turn inspire others to help people in their communities. Share International gives extracts below from recent speeches and writings by the Pope and the Dalai Lama, two inspiring and revered world figures whose statements are helping to disseminate and support Maitreya’s priorities. According to Benjamin Creme, they are doing the work of Maitreya and helping to sway public opinion by their tireless example. Their words echo teachings of Maitreya on peace, compassion, and above all the implications of the oneness of all life. Pope Francis focused on a reading from St Luke’s Gospel, in which Jesus tells his disciples to reject materialism and work for the kingdom of God, and to store up treasure in heaven. “For,” he tells them, “where your treasure is, there also will your heart be.” Jesus then related three parables about the Second Coming, the common theme of which is vigilance. The unexpected return of the Master of the House, the thief in the night, and the behaviour of the steward in the wake of his Master’s departure, each points out for us the need to be alert, watchful, and paying close attention to our duty of service to others, as we await the Second Coming, whose return is certain, but whose hour we cannot know. “… With this Message [on Creation Day] I renew my dialogue with “every person living on this planet” about the sufferings of the poor and the devastation of the environment. God gave us a bountiful garden, but we have turned it into a polluted wasteland of “debris, desolation and filth”. We must not be indifferent or resigned to the loss of biodiversity and the destruction of ecosystems, often caused by our irresponsible and selfish behaviour. “Because of us, thousands of species will no longer give glory to God by their very existence, nor convey their message to us. We have no such right… Global warming continues, due in part to human activity: 2015 was the warmest year on record, and 2016 will likely be warmer still. This is leading to ever more severe droughts, floods, fires and extreme weather events. Climate change is also contributing to the heart-rending refugee crisis. The world’s poor, though least responsible for climate change, are most vulnerable and already suffering its impact. They run headlong into suffering. Destroy it, as if it were their enemy.